The first woman to graduate from dental school had some roadblocks to overcome. When Lucy Beaman Hobbs Taylor was initially denied admittance to the Ohio College of Dentistry, she forged her own route. First, she found a mentor. Then, she taught herself the principles of dental care until she was proficient enough to open her own practice in Iowa. She was eventually permitted to enroll in dental school and graduated in 1866. Ida Gray Nelson became interested in dentistry while working part-time in a dental office. This experience helped her pass the entrance exam for her dental degree. After receiving her degree at the University of Michigan in 1890, she moved to her hometown of Cincinnati, Ohio, to open her own practice as the first African-American dentist. In 1913, Grace Rogers Spalding joined efforts with another woman dentist named Gillette Hayden to form the American Academy of Periodontology and holds the title of the academy’s first woman president. Additionally, she left a lasting impression on periodontology practices as an editor of the Journal of Periodontology for 20 years. In her work, she emphasized the importance of gums and supporting tooth structures instead of merely focusing on teeth. In 1944, Sara Gdulin Krout became the first woman dentist to serve in the U.S. Navy. At the time, the military restricted women from providing dental care, so Krout became a lieutenant in the U.S. Navy Women Accepted for Volunteer Emergency Service. Today, roughly half of dental school graduates are women compared to just over 1 percent in 1968. 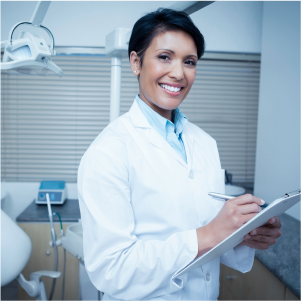 Thanks to the bold efforts of female dental professionals, the path is more open than ever for women to make their mark on dentistry.